Bought their Revel from a different RV dealer and were unsatisfied with their orientation experience until they came to Lichtsinn RV! Just bought a Revel 4x4 from Lichtsinn RV this summer. Very enjoyable experience for our first RV experience. Very knowledgeable and all questions were answered in a friendly manner. They genuinely want you to have a good experience when buying an RV. Nicole Blaser was fantastic and attentive to our specific needs. Travis in service very thorough in our walk thru. They know what they are doing and they take great pride in that. Especially if you are a newbie to RVs, they are the place to go. After what seemed like a very long wait we picked up our new Revel on June 6th. Everything about our buying experience with the group at Lichtsinn RV - starting with Reed Burkholder in the sales department thru the orientation was fabulous. Everyone was friendly, helpful and extremely knowledgeable in every way. As we drove away with our new toy - for a five day drive back to California - we did so with smiles on our faces. We would highly recommend Lichtsinn to anyone interested in purchasing a RV - you won't be disappointed with the customer service. I’m not currently a customer or (guest) but wanted to take a minute to thank you for the wonderful videos that you and your team have produced. My wife and I bought a 2018 Travato 59K from a local dealer near our home here in San Jose California. I know, that doesn’t do much for you but you got us to drive to Gilroy California to look at the Travato in person after I saw it in your videos. Thank you. These first-time RV'ers are preparing to hit the road now with the purchase of a new Winnebago Aspect 30j! After thinking about RVs for a few years and doing our homework, we knew we wanted a quality-built unit backed by Iowa-nice service. We found it at Lichtsinn RV in Forest City, IA. From Jason and Reed in sales to Ben who gave us the whirlwind tour to Kevin who helped us seal the deal and Hannah who answered questions for our first two days on the road, we've had an extraordinary experience! First class operation. From the first inquiring phone call to any follow-up questions after the sale. As first time RV owners, we can't compare Lichtsinn RV to any other dealer, but I can say this. If car dealers were half as courteous and knowledgeable about their products as Lichtsinn RV was about theirs, it would make car buying a lot more pleasant. Reed was our salesman and was very courteous and helpful in introducing us to, and showing us around the Vista LX we purchased. The whole process went off smoothly. The young man that gave us the orientation was terrific and very practical in his explanation of the different systems and gave us excellent tips on maintenance. After the orientation, he helped us pick up a few basics that he knew we would need on our first outing. We were also introduced to Anders in service who was also most kind. Nice store, nice people, good deal. What more could you ask for? Thanks for all you did to make our first purchase a pleasant experience. Everything met my expectations at Lichtsinn RV. Nicole Blaser arranged transportation from a major airport to the dealership for us along with sending educational videos from the website. The orientation for our new motorhome was excellent, we were not rushed and was very complete. Just back in Montana with my new Revel 44e. What attracted me to Lichtsinn RV was their low pressure, low hassle approach, and the educational material they have available online. All this proved to be the case. Their orientation is thorough, but for a first time RV owner I needed a second go through the next morning (in person), and a third one on their web site when home. A minor issue with a rattle in the slide door window was very quickly fixed. Everyone and everything, from sales to financial to service to pickup at airport to owner, was friendly, organized and essentially hassle free. We drove 1500 miles to trade in our old RV for a new one because we felt we could trust Lichtsinn RV and get the best help and best deal from them after reading other reviews as well as comparing other dealerships close by, what they offered, and the reviews they got. We made the right choice; Lichtsinn was top notch in every way. No regrets. We would not hesitate to do it all over again with Lichtsinn if we had a need. "I want to send a big thank you to Anders and the rest of the team who performed warranty work on my 2017 View 24g. I continue to be impressed with the professionalism and outstanding customer service. Problems happen and no one likes it when they do but poor service only makes things worse. Not the case here. Thanks team Lichtsinn! " "Lichtsinn RV matched the price of another dealership. The orientation Brad provided was excellent, better than I have ever received in the past having owned other RVs. The friendliness of everyone at the dealership was memorable to my wife and I. " "I appreciated the interaction with the owner, Ron Lichtsinn. Lichtsinn RV staff is knowledgeable and the dealership is very clean! " "The employees at Lichtsinn RV are very knowledgable and we were greeted by all employees. We appreiciated the prompt service and the convenience of having a courtesy vehicle. Lichtsinn RV team gets 5 stars from us! " "Lichtsinn staff is outstanding and friendly! They offered a fair price and provided prompt repair service." "Stacy Anderson and the whole Lichtsinn team were fantastic. Whole pick up process was easy and customer service was great! I would definitely buy from them again." "My wife and I drove from North Carolina to pick up our 2018 Winnebago View. The timely delivery process was handled by a professional staff. Last minute additions to our coach were taken care of promptly which allowed us to depart on schedule the next day. Being able to stay on site at the dealership is a big plus. I highly recommend checking them out." "I can't believe how nice and helpful everyone was at Lichtsinn RV. What a beautiful location and you can spend the night there to check out your RV." "I want to thank Nicole Blaser, Justin and Travis who were so helpful getting us the right RV and sending us down the road feeling knowledgeable and comfortable. We rented last year and Nicole was very helpful and caring when we had a small issue. We decide to buy an RV and began the search. After talking to tons and looking the internet up and down we determined a person we could trust was the best place to start. We called up Nicole, and yep........she is the best. Your guys from the shop put no pressure on as they educated us and took care of every detail. Great experience!" "We had the BEST buying experience ever. This is truly a customer oriented dealership. Our sales consultant Reed Burkholder was the finest sales professional we have EVER worked with-thorough, honest and professional in every respect. Every other member of the staff treated us as VIPs even though we were just normal customers. I have bought five RVs and that was the finest experience I have ever had. I drove over 800 miles to deal with Reed and his colleagues. It was worth every minute. Words fail me because I run out of superlatives when describing my experiences at this truly outstanding dealership." "I recently purchased a Minnie Winnie 22M from Lichtsinn RV and it was a great experience! Special thanks to Jason S., Brandon, Luke, Justin and Hannah... as well as anyone else I may have interacted with when I was there... Everyone I met was knowledgeable, professional and very friendly. These guys put customer service first!" "Stacy Anderson was fabulous! She kept in constant contact with us about our motor home, until the day that we came to pick it up. All of the staff--Dan, Luke, Jason and all the rest were of the highest quality in terms of their professionalism, knowledge, and friendliness. We were business owners, so we feel that we know what it takes to run a top-notch business; we have never been so impressed with a business, as we have with Lichtsinn--from start to finish. I'm originally from Forest City, and I am very proud that a business like Lichtsinn represents my home town so well. Thanks for everything!" "Awesome, awesome, awesome! Sweet people and good service. So glad we found you a year ago." "Kudos to Lichtsinn RV. Cass and I started our deliberations with various Travato dealers in March. We were not sure we wanted to buy too far from our home in Michigan...service, being a concern. The Lichtsinn RV YouTube videos on all aspects of the vehicle we were looking at plus, the webinars offered kept pulling us towards Lichtsinn RV. No other dealer we found had that wealth of information available. Based on the professionalism of the dealership and the friendliness and competence of Stacy Anderson our sales person, we placed our order. The timing of the build went according to plan and we picked up our Travato K last week. We were totally impressed by the dealership and staff. The three hour vehicle walk-thru by Brad covered every aspect of the motorhome as he patiently answered all our questions. Thank you to Stacy and everyone at Lichtsinn RV. Our K is wonderful!!!" "I love my new Trend. Nicole Blaser and team made this transaction very easy. I was very impressed by the atmosphere when we went to pick up the RV. They make you feel like family. We drove from NC to Iowa due to the professionalism of Nicole and her talking me through the process of what RV would be right for me. It was a tough decision and I wanted to deal with a dealer who had a great reputation for not only sales but service as well. So glad I went with Lichtsinn RV. THANK YOU!" "We could not be more pleased with our experience at Lichtsinn RV! The Lichtsinn team exemplified professionalism, friendliness and fairness. Reed our sales consultant stuck with us throughout the whole experience, finding solutions to our unique set of needs and engendering a high degree of trust. Brandon in the finance department worked with us regarding all issues arising from us being residents in a foreign country and solved any other issues that came about. Our service consultant Justin showed extreme patience and answered question after question with good humor. Mark, a service tech gave us an excellent, almost 4-hour orientation. Hannah, the sales manager set up a great tour of the Travato plant with her father. In addition, the staff treated us with kindness and warm smiles which went a long way to make purchasing an RV a pleasant experience. The Lichtsinn RV team is as good as the standards its leader sets!" "Reed provided us with excellent customer service. Ben and Anders in the service department were very willing to explain the motorhome functions to us. Brandon in finance department was very thorough going through the paperwork and explaining extended warranty information. Overall experience at Lichtsinn RV was great!" ""Jason was very patient with us first time RV buyers! He provided constant and clear communication throughout the whole process. The service orientation and follow up was a huge benefit! Our guest experience was wonderful, we never felt unsure or uneasy. BRAVO!"" "We could not ask for a better experience - Thank you!" "We just picked up our 2017 View 24g and are so glad we bought from Lichtsinn. This is our first RV and we have a lot to learn. Stacy and the entire staff made the whole process easy. Great deal, great service from great people!" "Lichtsinn RV is the BEST!....Jason Bruckhoff was so helpful and informative, the transaction was so smooth with the excellent staff. We traveled out to Iowa and had 2000 miles on the Era by the time we made it back to NC. A big thank you to Hannah Lunning, Dan Helgeson, Anders Bartleson, and Luke Hejlik." "I am officially no longer a wannabee. I flew to Minneapolis last Tuesday (May 16th) and was shuttled to Forest City, Iowa by Larry. We were at Lichtsinn by 1:00pm. My tech was Brett and he did a very thorough job going over all of the systems. Of course, even with taking notes, I promptly forgot a lot. I got to spend time with Brandon Mondt (Business Manager aka the money guy) Hanna (not sure…maybe Nicole’s boss) and Anders Bartleson (Service Consultant) he was very helpful and will be my go-to-guy when I have a question. Lastly, I can’t say enough about Nicole Blaser. Nicole was so pleasant to deal with and always going the extra step to make sure everything was taken care of. I was rushing because Colorado was having a snow storm due in on Thursday night…that I forgot to take pics at Lichtsinn. Well, the snow storm came in early and hit while I was driving in. Have I said yet how much I love my G? As I was driving the screen, where the speedometer is, said icy roads. I looked and the temp outside was 37 and it was raining. As I laughed at the silly thing, there was suddenly 3 inches of ice on the road and multiple cars in ditches. Yes, one of Colorado’s hail/sleet storms. We made it just fine, thanks to the warning. Has anyone else had this happen? I think my Travato's name is Lucy…she’s a girl, red, and makes me smile...the name is still a work in progress..."
"Once again had a great service by my RV dealer in Forest City, Iowa Lichtsinn RV. If you're ever in the area stop by and see them, friendly staff always willing to answer your questions over the phone if there is something you can't figure out." "Second time trading with Jason Bruckhoff and was just as easy as the first. Ron Iichtsinn has assembled a very professional and personalized staff. We found everyone to be pleasant, helpful, and honest. If we trade again, it will be with these people. "FACE REALITY AS IT IS" "BEST RV DEALER IN USA" "
"Lichtsinn RV provided experienced and wonderful employees, comprehensive orientation for our new RV and a very organized business approach!" "Exceeded expectations in all respects! Certainly the most satisfying vehicle purchase ever. Ron Lichtsinn and the entire staff demonstrated their committment to customer (or "guest" as they say") satisfaction at every contact. From my first phone contact with salesman, Reed Burkholder, he set the tone of responsiveness, honesty, and service. Lichtsinn RV was in a whole different league from the dealers closer to home. I admit we did have some hesitation about flying 1/2 way across the US to pick up our Winnebago View and drive it back to Connecticut. We are so very happy we did. "Our experience purchasing our Winnebago View 24J could not have gone any better. From the driver picking us up at the Minneapolis airport, signing the documents, the walk through, and our use of a courtesy vehicle while in Forest City. Everyone was very knowledgeable, friendly, and helpful! The dealership offices, store, and restroom are all very attractive and well maintained. Lichtsinn's support didn't end with our visit to Forest City as various members of their team have given us advice and guidance by phone and email. Two thumbs up and five stars for Lichtsinn RV. We're glad we made the trip to Iowa. We got a good deal and the people we met at Lichtsinn were uniformly great!" "When we started our search, I was sure that I would buy locally in NY, but after communicating with Stacy Anderson many times and understanding all the potential benefits of Lichtsinn we changed our mind. As promised by Stacy and Dan, the long distance transaction went very smooth. We flew to Minneapolis and Lichtsinn driver picked us up and brought us to Lichtsinn and we were given a car to use while in the area. That afternoon Mark gave us a 3 1/2 hour orientation and was very patient answering all our questions. We stayed overnight the first night and became familiar with our new View motorhome before driving home. Before we left, Stacy setup a tour of the Winnebago factory which increased our belief in the quality of the motorhome. Since being home we had a couple minor issues that Anders solved quickly. Thank you to everyone at Lichtsinn for making this purchase a great experience." "Having traveled to the factory as we researched RV's, we decided on Winnebago vs other manufacturers. Our preference was then to order locally from Lichtsinn and handle the break-in driving ourselves. So glad we made this choice! This dealership sets a standard for professionalism and genuine concern for the customer. Stacy was gracious and helpful throughout the order and delivery process. Hannah, Dan, Anders, Brett and Justin were great while we were there...and Gary even kept us entertained on the ride from Minneapolis. Wish we were closer for future service needs." "After reading the reviews from previous customers, my husband, Lon knew this was the place we wanted to purchase our RV from. I can't even begin to tell you how they made us feel right at home. Like we were family. Each associate we spoke with was knowledgeable and went out of their way to support us. Special shout outs to Jason, Justin, Brandon, Chris, Brad, Abby, Lonnie and Anders. We look forward to returning for service and Winnebago Rally. To future customers make sure you go to the deli at Bill's and visit the YMCA. We love you guys!" ""I had the good fortune of doing business with you all, buying my new Winnebago Vista LX 30T from your dealership in November. I hope you received my 'final' report and survey regarding my experience - certainly a 10 on the 10-point sat. scale for sure! As I have become more familiar with my rig, and given I am 2,100 miles from Forest City, I have had to contact both my Sales Representative (Nicole Lovik-Blaser) and my Service Representative (Justin Overland) on a few occasions - both via phone and email. I cannot begin to tell you how helpful both of these good people have been to me. Of course with a new motor home there will be issues encountered, or items that I just plain forgot from my orientation. Justin has been extremely helpful in answering my many questions and helping me trouble-shoot issues from afar. And of course Nicole is always attentive and responsive whenever i need her help. Just a quick aside - I was camping on the Central Coast in California a few weeks ago. A new neighbor pulls up in a fairly new Winnebago, and of course we get to talking. Small world - he bought his rig from you all last Fall. We both couldn't pass out the praise any faster for Lichtsinn RV and all the great people. I am planning a couple BIG trips this year, and Forest City Iowa is definitely on my list. Although I have copied both Justin and Nicole with this email, I am sure you will find a way to pass along my thanks for all their help. I will say this in closing: people frequently ask me why the heck would I go all the way to Iowa just to buy a motor home. When I explain the extraordinarily high level of satisfaction I have experienced with your staff they usually get it. Lichtsinn RV obviously knows how to do business! My very best regards to you and all the good folk there." "On January 10th, my wife and I sealed the deal on our 2017 Travato 59K. Since this was our first RV, we had numerous questions even after doing research for several months. Our sales person, Jason Sprecher, did an excellent job of listening to our thoughts. He avoided the dreaded "pushiness" of some sales people. In addition, Jason demonstrated the patience of Job as we deliberated whether to purchase or not. After our orientation, we went to the business office and took care of all of the paperwork. Then, Lichtsinn was very kind to let us pull our van inside to load the Travato out of the snow storm that had set in during the day. Because we wanted to leave immediately on our trip, they allowed us to park our van in the back while we were gone. So, a shout out to the friendly staff, the owner (Ron), Jason, Dan, our tech orientation person, and our American Family Ins. agent, Brett, from Northfield, MN. All of these individuals worked together to make our experience stress free and enjoyable. (And.. in case you are wondering, we are not related to any of these inviduals nor do we work for any of the businesses involved.) Oh, I almost forgot. Before we left, we were given the business card of a Lichtsinn service consultant assigned to us should we have any questions in the future!" "We took delivery of our 2017 Aspect on February 17, and we could not have been more pleased or impressed with our experience at Lichtsinn RV. We were thrilled to find we could look at the Aspect inside one of your large, warm bays on a cold, winter January day. Stacy Anderson assisted us that day - she was friendly and made us feel welcome, but even more importantly, we were impressed with her knowledge of the Aspect. Stacy remained in contact with us throughout the entire purchase process and answered all our questions with detail and patience. We also had the opportunity to work with Hannah, Brandon, and Justin, and appreciated the way they handled their parts of the transaction, as well. And last, but not least, was Luke - we have one word for Luke: outstanding! His presentation during the orientation was great...he was thorough and knew everything about the Aspect...inside and out, and we very much appreciate the way in which he shared his knowledge with us. His previous experience with Winnebago Industries is serving him, and your dealership, very well! There are several reasons Lichtsinn RV is such a successful Winnebago dealerhship: your staff and the leadership they obviously experience! We are highly impressed with your dealership, and your staff. Everyone was professional, friendly, and treated us as though we were the most important people they were dealing with that day. Thank you...the words don't seem sufficient to express our sincere gratitude for all the things you are all doing so right! We are grateful for the experience of doing business with you. And, we would be remiss if we didn't mention the fact that we love our new Aspect and are anxious to see where she will take us next! Winnebago did a great job building the Aspect, and your staff did a great job preparing her for us! We look forward to traveling in our new Aspect for many years to come." "I have the great good fortune to live 1.5 hours from Lichtsinn RV. I have been shopping for a small motorhome for many years and had the lichtsinn website bookmarked on my computer. None of the small motorhomes were quite the right thing until I stumbled on the Travato 59G. I purchased at Lichtsinn in December 2016 and they have always been great to work with at the shopping and sale. Now the after sale experience is even better, I just got an email from Justin that an alignment is recommended after 1000 miles. What a nice thought. Emailed my salesperson Nicole about a service appointment and Justin promptly called back and had it all set.up. easy peasy." "After two Travato 59G's in two years we decided to give the 59K a try. Ron Lichtsinn agreed to a fair price for a unit in their inventory so we didn't need to wait for an order. As professional an organization as you can ask for with great communication skills and processes. No question unanswered and many answered without need to ask. Everyone we dealt with - Ron, Heather, Ben, Brandon, Lonnie, and Anders - was on the top of their game. No pressure and smiles all around. A great purchase and delivery experience." "Jason S. was very attentive and helpful. He made sure we got back on the road ASAP to go home that cold windy day. Jason was overall excellent in the whole process. Dan had all of our paperwork lined up and ready for us to sign. Very efficient. Ben gave us a thorough technical instruction. Thanks Ben for being so patient with us. We had a lot of questions and you were very professional, kind and understanding." "Lichtsinn RV has been a parts resource for my 1994 Warrior. They provide great advice and service. Thanks for all the help and we'll be in contact again ... and I love the red shirt." "David Straw is an awesome parts guy. Bought many parts from them. Always willing to help and ship items." "I bought a 99 Itasca sunrise three years ago to put my toe in the water to see if I like RVing. I don't know if I will ever buy a new motorhome, but would strongly consider buying from Lichtsinn. I have ordered several parts from their parts department. I always received courteous and very helpful service from them, despite the many stupid questions I asked as a novice RVer." "Awesome buying experience with Lichtsinn. We are in Texas and everything went like clockwork. Great price, fair trade in value and no glitches when we picked up the new RV." "Great place to buy your new RV! We flew to Iowa and bought ours for much less than we could have for the same vehicle in Albuquerque and then drove it home. They have excellent customer service and we toured the Winnebago factory while we were there. All in all a great experience." "We are the proud owners of a new Winnebago Fuse 23A purchased from Lichtsinn on December 19, 2016. Our experience was wonderful from the very beginning. Nicole Follman, our sales consultant, listened carefully to our concerns and wishes. She even took photos of our Fuse and emailed them to us so we could be sure everything was cosmetically what we ordered. After we ordered the Fuse, Nicole kept us updated weekly on the completion/delivery date. It was nice to know that we hadn’t been forgotten about! David and our son flew to Minneapolis from Nashville, and a Lichtsinn driver took them to Forest City the next day. Our beautiful Fuse was waiting indoors on the cold winter morning. Service staff and other personnel introduced themselves and made them feel welcome. The orientation was extensive, and we were impressed by the technician's knowledge and patience. We were even warmly greeted by a Winnebago manager. We purchased some extras which were quickly and professionally installed by the service staff. We were provided a space to spend the night in the Fuse and were given a car to use that evening. The experience from beginning to end was outstanding. We are sad that because we live in Knoxville, TN, we are too far away to have our service done by Lichtsinn in Iowa, but hope to visit them on one of our trips. We recommend them to anyone looking not only for a great deal on an RV, but also for outstanding service and professionalism. We can say with confidence that we experienced "southern hospitality" in the Midwest at Lichtsinn RV." "Nicole Lovik-Blaser was very helpful when showing us the RV from the first time down there. She clarified a lot of things for us and if she wasn’t sure on a question, she checked right away and got back with us. Everyone at Lichtsinn RV was just so very friendly and had such a wonderful sense of humor – Nicole, Ben (service technician) and Dan (finance)." "Our sales consultant Nicole Follman and the rest of the staff at Lichtsinn RV were professional in all areas – pre sale advice, communication regarding delivery schedule, travel arrangement, orientation and the closing process. Lichtsinn RV was very welcoming, has a friendly staff and have a comfortable environment. They also furnished us with a car while we were there which was great." "Our sales consultant Stacy Anderson responded quickly and accurately to questions we had about the coach we purchased and was up front with pricing. We gathered great info via videos on the Lichtsinn website." "I worked with Jason Sprecher in sales by phone for over 2 months and picked up my custom 2017 ERA on Tuesday before Christmas. Orientation (Luke), paperwork (Brandon & Hannah), Maintenance (Brian & Justin), and parts (Chris) were all eager to help with my delivery. Everything went smoothly and professionally. On my way home (925 miles), they even were happy to answer a few last minute questions which arose after I left Forest City. 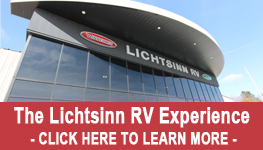 Lichtsinn is THE place to buy RVs." "My sales consultant Nicole Follman and Lichtsinn RV got me exactly the unit I wanted out of all the myriad of options. She also worked with me on the additional customized options desired. Lichtsinn RV went above and beyond in a last minute non-standard vent change." "Lichtsinn RV takes care of their customers. We have been searching for an RV for 2 years and have been to numerous dealerships. Lichtsinn RV is second to none. Our orientation was very informative and well presented. Our sales consultant Nicole Follman was great to work with! Her follow-up emails were refreshing and she stayed in touch with us even after the sell (A+)." "I arrived to pick up my new Travato 59G late in the day, but the staff at Lichtsinn were wonderful as they assisted me in getting through orientation/inspection, financing and departure in a fast, efficient, thorough and friendly manner. The RV was immaculate and prepped perfectly. I'd like to thank Reed Burkholder (my sales consultant), Gary Compston (the driver who picked me up in Minneapolis), Hannah Lunning and Heidi Thompson for meeting with me, Ben Follman for the great orientation, Anders Bartleson for offering his Service assistance and Dan Helgeson for the no-pain paperwork and financing. It was a wonderful experience with professional staff that I don't hesitate to recommend to anyone looking for a new or used RV purchase. My only regret is that I couldn't hang around longer (was trying to beat the snow and cold back to the Northwest)!" "Our sales consultant Nicole Lovik-Blaser provided the terms of contract upfront and they did not change. Within a few hours, we had the additional equipment Installed we requested. Lichtsinn RV also provided us with a loaner car and RV parking/electricity hookup for our trade in. Thank you." "Barb and I want to thank Nicole and Hannah for the great buying experience we had with Lichtsinn RV. This was our first RV purchase and we didn't know what to expect but we were pleased with the process. Everyone was friendly, professional and helpful along the way. Thank you Lichtsinn RV for making this a good experience." "We ordered a new 2017 VIEW from Lichtsinn in September and took delivery recently. Wow, what a pleasant buying experience. Since we live 1200 miles away, all pre-delivery communication and paperwork was done via phone and internet. Hannah in the business office and Nicole in sales made the process very painless. We were updated weekly on the status of our order and the delivery date. The customer service is outstanding. We were warmly greeted upon arrival at the dealership and everything from the paperwork to the walk-thru and orientation of the VIEW went very smoothly. Our unit was as clean as a whistle inside and outside when we first saw it. We just can't say enough about how professional and caring everyone is at Lichtsinn. For us it was well worth the 1200 mile drive. Being able to camp overnight at the dealership was a big plus for us. And I liked being able to do the engine break-in myself on our way home." "Lichtsinn RV deserves all 5 stars plus more. We have had everything from tents to diesel pusher over the years and have dealt with many sales/ service folks. All of our contacts within the Lichtsinn organization were positive experiences. It doesn't matter where you live your not too far away to deal with Lichtsinn." "This is the third coach we have bought from Lichtsinn RV since 2011. Each experience has been wonderful! Every employee goes above and beyond to be courteous and helpful! Ron Lichtsinn treats you as a friend as well as a customer! We highly recommend this dealership and the people to work with! Thanks Lichtsinn RV! "What a pleasure to work with Reed and all the other staff that helped with the delivery of our new Winnebago Journey. No high pressure sales tactics, and all issues we found were taken care of while we were staying at the beautiful Lichtsinn facility." "Thanks to Reed Burkholder and the staff at Lichtsinn RV. I purchased my first RV in June 2016 as I needed a place to live while building a new home. Reed and everyone made it such a wonderful experience, that I decided I wanted a newer and smaller RV to use for pleasure. So Reed offered up several options so I had a nice array to chose from and I traded my 1999 Itasca Sunrise to a 2012 Winnebago Via 25Q. As a first time RV owner, I had my questions and concerns, but The Lichtinns staff answered everyone of them and made me feel a valued part their family. So thanks again, Reed, Heidi, Dan, Justin, Anders and Brett!!" "I picked up a Travato 59K a week ago. My experience with Lichtsinn was excellent. The RV was lugged in and ready for me when got there. I planned to stay there 2 nights but ended up staying 3 only because I asked for the sink to be replaced - it had a small rust spot on it. Picky I know but they didn't give me a hard time and replaced it in half a day. The orientation took several hours and was also excellent. I asked as many questions as I needed to and they were all answered patiently. Similarly later my assigned Tech Support rep also answered all questions patientlyly. I am very happy with my sales and support experience so far at Lichtsinn." We look forward to a continued service relationship with Lichtsinn RV! " "Thank you to Ron, Hannah, Brad, Justin and the whole crew at Lichtsinn RV. The staff was attentive, had great attitudes. It was a pleasent experience." "Nicole Follman provided: Great customer service was very quick to respond to questions. Our orientation video and walk through were terrific. Also, no high pressure sales." "Our View was exactly what was promised. Our coach was ready on time with all of the extras installed. Your performance was perfect." "Jason Sprecher was extremely responsive to all of my questions and was very informative. The incredible videos and the beautiful clean building were very impressive." "This is my third RV purchase is almost twenty years.....that being said; I can't begin to express how great the folks at Lichtsinn are! From the sales, business, and service departments....in one word they are "GREAT". Needless to say they blow everyone else out of the water with pricing....plus by taking delivery in Forest City I was able to break-in my new coach. Thier facility in Forest City is world class. Give them a call...you won't be disappointed. This is the first and only dealership that I've ever been able to praise. " "The folks at Litchsinn RV were awesome! I’m so happy with my RV and the buying experience. I have not had any troubles with my used RV so I do not know about thee service dept, but from what I’ve experienced so far I have no worries. Thank you Reed, Dan and Mark. Happy trails! " "All of the personnel that we came in contact with were extremely knowledgeable! Nicole Lovik-Blaser, Hannah and our guide giving us our orientation. The driver from the airport was very friendly and more than willing to go out of his way to show us around. We are so pleased with Lichtsinn Rv. They go out of their way to give you the best service possible. We took advantage of staying on their property to get accustomed with all aspects of our RV. They helped us so much with everything. "We appreciate the cost of the RV and the locations close proximity to Winnebago. We did not like the idea of someone else driving our new RV over 1,000 miles to our location while towing their return vehicle. Since arriving in Forest City, everyone we have come into contact with here at Lichtsinn RV (sales, service, finance) has been very helpful. They also encourage future contact for any questions/issues we may have. " "Our new Travato is our 4th small Winnebago. We made plans in March get it at the rally, but a whole bunch of problems came up and the staff just kept in touch to change our delivery. We have always been satisfied with the service we get at Lichtsinn and we'll probably get another Travato in 2 years." "From the first day we walked in to Lichtsinn RV, we received excellent service and attention from their staff. Reed Burkholder discussed several options with us and after searching for many months, we finally found the Winnebago best for our family. Reed walked us through the process of ordering the RV and kept us informed with frequent emails over the summer as we anticipated its completion. It was a smooth process with many friendly faces and support along the way. We are pleased to have a Winnebago built in Iowa. We received great care from Reed and the entire staff at Lichtsinn RV. Thank you!" "Our experience started with Casey Singelstad. We can't say enough about her! What a professional, intelligent, and pleasant person. While in Florida, Casey and I spent many hours communicating by phone, email and texting. Casey is very patient and answered all questions we had. We both left with a hug and picture with Casey and our new coach! For our walk-through, we had Mark Delzer. Mark spent hours explaining our new coach to us. We are new at this type of camping. Mark was also very patient and informative. Again, we feel fortunate to have had his help. Like Casey, Mark made us feel very comfortable. Then there is Justin Overland. As you know, there is an enormous amount of information! We enjoyed Justin's relaxed and friendly attitude. Like the rest of your staff, Justin made us feel very comfortable while answering are many questions. Justin always has the time to help everyone. In fact I just called him the other day with a small problem. He makes a person feel that you could call him anytime. " "From Reed to Hannah to Joshua to Luke to Chris – everyone we’ve talked to, even those not directly involved in our sale – have been superb.."
"We've been pulling a travel trailer for years and wanted to simplify our travels so started looking at smaller motor homes with a specific eye on Winnebagos. We traveled from Missouri to Lichtsinn because we heard they were one of the best to deal with and could always be counted on for helpful service. We met Nichole Follman and she took the time to let us go through almost every unit on the lot - -which is a lot!! We finally decided we didn't want to invest in a new motorhome but would consider buying a used one if the opportunity arose. Nicole was quick to call us when a 2014 25 B Minnie Winne came in for a trade. She knew the owners and thought this might be just the rig to get us started in a motor home. She did the video tour and actually gave it a test drive for me. When we arrived to pick it up it looked like a new one and they were quick to take care of a few minor issues when we did the final inspection. It was a real pleasure working with Nicole, Dan , Brett (the service guy) and Mr. Anderson at the parts counter. I'd recommend Lichtsinn to anyone looking for a Winnebago. By the way we just got back from our first 1800 mile trip in our 25B and we couldn't be happier - -it's really simplified our camping and touring experience.."
"Lichtsinn RV sets the bar for all other Winnebago dealers. I have never dealt with any organization that is 110% customer oriented! Our 2017 Forza 34T is the second motorhome we have purchased from them, both during GNR. Each time all the staff excelled in trying to meet our needs. Nicole Follman and Justin Overland went out of their way to solve all of our problems in a very timely manner. I wouldn't even consider any other dealer for my Winnebago purchase, even though they are 570 miles away!." "Today and from day one on the telephone - your customer service, in all departments has been outstanding! Dan in Finance, Jason in Sales, Luke and Jason in Service were professional, pleasant, accommodating and went beyond all good standards to excellence! The orientation was so, so appreciated, so thorough and it more than highlighted how every minute detail of the Winnebago View is well-engineered. The little touches you make are refreshing and touching. Mainly though, we felt your strong commitment to integrity." "We have been RV'ers for 22 years and our new Travato 59G is our 5th unit. I did a lot of research online to find the best place to buy from. My local dealer does not stock or sell Travato's so they were not very receptive to me. All of my searches kept pointing me to Lichtsinn as the top Winnebago dealer to deal with in the country. Once I sent an email, the process began. From the first reply I got, everyone I talked to or dealt with has been totally professional. Definitely a different RV dealer experience than any I have had before. They factory ordered my unit and made the process seamless for me. I was updated weekly and given a delivery and orientation date early on in the process so that I could make my travel arrangements. They even picked me up from the Minneapolis airport. The delivery process was flawless and I really appreciated being able to camp at the dealership the first night. Our salesperson was Nicole Lovik-Blaser, and she did an awesome job making me feel very special and like an old family friend. She even arranged a tour of the lake Mills plant for me, where Travato's and Era's are made. My experience with Lichtsinn could not have been better. It is the nicest and most professionally run RV dealership I have ever visited. I am so impressed by Ron and his entire staff. I hope to make it to the Grand National Rally next year and in coming years. I will definitely always swing by Lichtsinn to say hello to everyone.."
"Purchasing an RV at Lichtsinn was a superb experience throughout every context, and within all aspects, of the purchasing process. Nicole was a knowledgable, caring, patient and responsive sales counselor with answers, factory rapport and without ever exerting pressure. Then upon delivery every member of their business, parts and service team were attentive, seasoned professionals. This dealership's clear and present team approach is truly first class in every respect, including offering an impressive physical ambience that is unsurpassed, not only as an exemplar within the RV industry, but I believe in greater automotive industry as a whole. Plus, I found there to be exceptional value, by paying no more for this level of seasoned, first class attention, ... from 1st phone contact to a "all-smiles" drive-away in our new View, ... and now to after-the-sale support and service.."
"We appreciate the cost of the RV and the locations close proximity to Winnebago. We did not like the idea of someone else driving our new RV over 1,000 miles to our location while towing their return vehicle. Since arriving in Forest City, everyone we have come into contact with here at Lichtsinn (sales, service, paperwork administration) has been very helpful. They also encourage future contact for any questions/issues that we may have.."
"We have over 30,000 happy miles on our Itasca Nation iQ. We get lots of comments on its layout and appearance, build quality. When anyone asked where or how to get an RV I always tell them, “Hey, get in touch with Ron at Lichtsinn out in Forest City, Iowa. They’re just a mile from the Winnebago factory, and I guarantee they will treat you right.” I tell them the story about how when I flew out in 2007 to pick up our first RV [a Winnebago View], I was staying in the RV on your lot for the night. There was a tornado watch that night, and you came back into town and gave me your phone number to call should the winds get too nasty, and you would come fetch me back to your home. That kind of caring is quite uncommon anywhere else. I also share my experience calling your service/parts folks when I needed a part on the road, and how it was express shipped to me overnight. You folks are simply the best. We plan a trip west in the next year or so, and we have Forest City and Lichtsinn RV on our itinerary. Our Navion has been all over Maritime Canada, down to Miami and back, with assorted side trips. I trust your knowledgeable, cordial approach to helping customers is being rewarded in your heart as well as your successful company." "The entire operation works hard to provide excellent customer service. They are accustomed to working with customers remotely and they communicate regularly to provide updates which is nice. Hannah, the Business Manager, was amazingly helpful in assisting with financing. Hannah also made sure that all of the many loan closing steps were accomplished so that we closed on time. It was so nice to be able to email and phone actual people who wanted to help us accomplish our RV dreams. A special thanks to Reed and to the service department for helping us to figure out what features we needed. Would never buy a RV anywhere else!." "My wife and I were shopping for a Class B van to replace our Truck Camper and had narrowed our choices down to a Travato 59G or 59K, all via online reviews and the Travato group on Facebook (a great resource, by the way). After a really bad experience with a local Winnebago dealer here in the San Francisco Bay Area, we decided to give Lichtsinn a try since no dealers anywhere near us had inventory to show us. The salesperson assigned to us, Nicole Lovik-Blaser, was extremely patient and helpful in answering the many questions we had. Tape measure in hand, she spent well over 90 minutes giving us a detailed "video tour" of he coach over the Internet (as the former CTO for a technology company, I was impressed with their creative use of technology. Every time we had a question, we got a response almost immediately. We ended up purchasing a 2016 Travato 59K they had in inventory, which they also retrofitted with some of new features from the 2017 model year, which was a great help, saving us both time and money compared to waiting on a new 2017 model from the factory. When the "K" was ready for delivery, they picked me up at the airport (for a reasonable $100 fee) and then spent the better part of the day on orientation with the coach, which was thorough and professional. I did run into a small problem during the trip home which required a return to the dealer, but their service team resolved the problem quickly and to my complete satisfaction. Though I had to fly more than halfway across the country and drive back, I can heartily recommend the team at Lichtsinn RV for their product knowledge, professionalism and overall friendly and responsive customer service." "This is an awesome dealership!!!!!. My sales consultant Reed Burkholder was so patient and knowledgeable in answering my many questions as a first time buyer. The entire staff from sales, administration, service, orientation to parts dept were so friendly. I purchased a used 1999 Itasca. The day I picked up the RV, I was given the same 5 star treatment as the other people picking up their brand new RVs. I stayed and camped overnight so I could asked questions the next morning. Very pleasant stay. I would recommend this dealership to anyone wanting to purchase an RV. If you spend a few hours in the dealership and visit with other customers, you can see why people come from all over to purchase RVs from this dealer. Thanks again everyone at Lichtsinn RV!!!!!!" "What a fabulous experience we had with Lichtsinn for the purchase of our new Navion. We had some unusual timing factors with the delivery, but the staff handled all of them in a professional and caring manner. Everyone from management, sales, office, and service was willing to go the extra mile to make this go smoothly. Thanks to Ron, Jason, Dan, Anders, and Mark. They are the reason this dealership is at the top." "The entire process of trading our Vista for a larger more grand kind friendly Vista went very well. Jason S. kept me in the loop on the arriving trade and I bought it sight-un-seen because of the reputation Lichtsinn R.V. has and having communicated with Jason previously. When I arrived at Lichtsinn for my appointment everything went well. Everyone involved with the purchasing process were professional and easy to work with." Our salesman Reed and the entire staff at Lichtsinn are first class. This is the 5th Winnebago we have owned and the buying experience was wonderful! Thank you so much for the great time. We took delivery of our 2016 Nation 24J in May, 2015. Last week, May 9th, I returned to your dealership to resolve warranty items before our first year of ownership was up. The end results were better than I could have hoped for! During an inspection of the motor home, a seal on the roof, was found to be defective and was repaired (I didn’t know I had a problem). Justin expedited a “purchase order” with HWH and saved us $500+ on leveling jacks we had installed later in the week. All and all, we will be back. See you down the road. Thanks! " I bought a Winnebago View from Lichtsinn earlier this year. I live in CT and I traveled all the way to Iowa to buy from Lichtsinn. It is a long way to go for an RV that I could have bought here in CT. Let me tell you why I traveled so far to buy this RV. I started my search for an RV a few years back and in the process came across Lichtsinn via their wonderful YouTube video series; if you have not seen it, go find it. I looked at RV's locally and in a radius of about 150 miles from my home. I found a number of dealers that I could have bought from. One of the dealers I caught telling lies, one I found myself telling them what the features of the RV were, one just did not return my calls, and one did not seem like they could handle the solar install that I wanted from the dealer at the time of purchase. In the end, the choice was pretty simple; I could buy locally and get worse service, or travel to Iowa and do better. I chose the latter. Lichtsinn did not let me down. From the first day I contacted them, till today a month after the sale, they are there with me; fair, honest, and knowledgeable. They lead me through the process of selecting features and making an order, made my wife and I feel at home when we arrived, helped us understand the RV's complexities both at the time of delivery, and beyond, and I believe truly cared that we are happy with this major purchase. If you are buying a Winnebago you should seriously consider buying from the experts at Lichtsinn, no matter where you are located. It will be worth the trip to get the quality of service and expertise of Lichtsinn RV. If I ever buy another RV, I will be coming back to Lichtsinn. I recommend Lichtsinn 100%! Stayed two nights at Lichtsinn lot. Very enjoyable experience. Reed and all the rest of the Lichtsinn staff were extremely helpful, nice and very competent. Explained everything about our View and answered all our questions. We have never felt so trusting and well cared for by an rv dealer. Quite an amazing organization. Highest quality everything - motor homes, facility, staff and customer service. Love our new rig. It is in phenomenal condition and includes a 60 day warranty! Thank you guys again for the incredible long distance purchase experience. We feel like we were treated like we purchased a million dollar motor home, and when the time comes to do just that we will be coming back to Lichtsinn Motors. "VERY pleased with everyone at Lichtsinn from Ron, to our salesperson Nicole, to Hannah. We would definitely drive the 1200 miles again to shop at Lichtsinn RV - ethical , professional, and considerate." Your team is great... Bill is an awesome trainer and person. He was very patient and understanding, knowing that I am a newbie. Reed and Hannah make the process easy. Thanks again for you help. You should be very happy with your staff. "I was an absolute beginner in this process of buying a motor home. At every point, dealing with the Lichtsinn staff was a pleasure. They were patient, answered my same anxious questions over and over and never lost their good humor. It was a pleasure to be well met at the airport, greeted on arrival, and gently introduced to all the complexities of MH management. Ron Lichtsinn stopped by to say 'hi' in the process. And, even better, their followup has been thoughtful and on target this is business well done, and a pleasure to deal with." "Delivered what promised, when promised and the price promised. Provided a professional walk-thru and answered all questions... Bill, in the service department, was ultra-professional and courteous. The sequence of events from pickup at the airport through the walk-thru, the move in and paperwork all seemed to be geared to our priorities and comfort." "Indeed, the individuals that made our purchase experience memorable are part of a high-character, high-performing team that functions in a very special work culture that pervades Lichtsinn Motors.....thank you to everyone at Lichtsinn Motors that had a part in making this remarkable experience." We just got the Scamp 5th wheel yesterday, and we love it! Nicole was a pleasure to deal with. She was very friendly, and so great about returning e-mails and phone calls promptly. We would definitely buy from you again if the opportunity arises. "Ron and the boys, (and girls) will impress you. You can stay right on his lot and/or roam the area for a few days to get the feel of the unit." Dorothy & I have owned motor homes for over 30 years. This is our fourth motor home, three of them Winnebago. This was our first dealing with Lichtsinn Motors. Your sales and technical staff performed well beyond our expectations. Other dealers have a tendency to unlock the motor home and disappear. Your staff stuck with us, answering questions, making us feel at home at your dealership. Nicole Follman made sure we did get to look at the four motor homes we mentioned to her prior to our visit. She was careful to ask the right questions, listen, and guide us enough so we made the right decision. Nicole wanted to make sure that if we purchased, we would be happy. She also called us later in the evening to answer any additional questions we had and to make sure we were comfortable. Your staff is one you can be very proud of. You're entire staff, Nicole, Casey, Hannah, Tim (Service Manager), and Jeff (Technician) all made sure we felt we were the most important people they had to deal with. Again, your staff is one you can be proud of. "The 'factory deliveries' are done through Lichtsinn RV, the Winnebago/Itasca dealership that is about a mile down the road from the Winnebago factory. Lichtsinn does the PDI and you can stay there overnight to get the feel for the motorhome. Lichtsinn and Winnebago are totally customer service oriented so you won't leave Forest City dissatisfied. I've never heard a complaint from anyone who took their factory delivery at Lichtsinn." "These days it's rare to get such great service, especially when it comes to an RV! Even though I purchased my 2014 Itasca Sunstar in Texas while I was living there, I've since moved to Colorado Springs and I've been looking for a place to order some parts. Lichtsinn Motors not only provides an awesome parts website, but your personal follow up and your efforts in expediting some parts that I needed ASAP has confirmed for me that Lichtsinn RV is THE PLACE to get any Itasca/Winnebago parts. My only regret is that I don't live near Forest City so that I could use Lichtsinn Motors for all of my service as well." "Feel free to quote me that I regret that I bought from another dealer in the West instead of from you. You know your product and offer great service!" "As for the coach - we LOVE it and feel like we have stepped into a brand new coach! Reed did a great job for us keeping us informed what was happening. Dan did an excellent job explaining all the paperwork and the warranty information. We had questions and he had answers for every question! I was also pleased that Winnebago also included time on a warranty as I didn't think they would do that. Brad - he's the BEST and went over all the systems on the coach since there are some that are new to us. He spent a lot of time with us and we appreciated his expertise. We are really into check lists and maintenance and will follow the advice of your techs and also the Winnebago books. When we get the survey from Winnebago we will complete it with the glowing comments because you and your staff did a GREAT job!" "Thank you very much. We have enjoyed watching your video clips and viewing your website for quite some time. Since I have been active in computer data communication since the 1980s it is refreshing to see someone who really understands and uses this media as it can be used to maximum effect. In this regard I felt your organization deserves to benefit from a job excellently done. Our road to complete the purchase process of the Navion was a long one. Without the excellent support we received from Nicole we would never have had the confidence to purchase an RV. The survey from Winnebago has not arrived as yet. I can state that Ben was excellent in his walk around and extremely thorough. There was four points of understanding that had been conveyed to me incorrectly by others which he illuminated for me very well. In general I typically withhold maximum scores on surveys. When I get the survey from Winnebago, I will give you maximum scores in all categories. Feel free to quote me, contact me, or ask anything of me in conveying the excellence of our experience. Our entire trip, the first to the Mid-West, has been pleasant, relaxing, and rewarding. We thank you, very much." "From the first phone call to the last training session our experience with the people at Lichtsinn Motors could not have been better. Jason arranged everything from receiving our three boxes of supplies to sending Lannie to pick us up at the Minneapolis airport. Our training session with Brad was well planned; we learned a lot about our coach and had fun thanks to his terrific sense of humor. The option to stay on-site with electric hook up and the use of a car the first night went way beyond our expectations. There was even fuel and water in their respective tanks! We purchased the Winnebago View 24V and the Mercedes drives like a dream - easier and better than our Mercedes SUV. We like purchasing a RV with only 22 miles on it rather than the "new" ones on the west coast with 2,800 miles....and we really are getting 17-18 mpg!!! Plenty of storage, beautiful refrigerator, exceptionally comfortable driver/passenger seats, and a great shower. Thanks again Winnebago plus Jason, Ron, Hannah and Brad of Lichtsinn Motors in Forest City, Iowa." "We never leave a dealer's name on our vehicle, however, we are proud to have the Lichtsinn Motors name on our coach. It's like a badge of excellence." "I just can't say enough about Casey! She competently answered our questions on everything from technical issues to decor. She was pleasant and fun throughout the process, and we just think the world of her. We feel through Casey we negotiated a good deal on this great motor home. Casey continuously kept us up to date regarding the progress of our coach and its delivery date, and communicated promptly to us all the details we needed to know in order to complete the transaction. She even called us this evening around dinner time to see how our trip was going. I don't know how she came to you, but hang on to her!" "By your professionalism in handling our situation you have really brough 'humaness' to your business and also brought forth excellent future sales by putting your customer's needs first." "Just wanted to send a note of thanks...We had wonderful cooperation from all employees. Casey was very honest and easy and polite to demonstrate [the] RV and answer our questions. Also Bradley was very knowledgeable and easy to follow in our orientation of our RV. He demonstrated very good leadership and frirendly atmosphere - good service." "Just took delivery of my 2011 Winnebago Vista from Lichtsinn last week. Living in Florida I shopped the local dealers, but they could not compete with the integrity, service and professionalism Ron and his staff demonstrated at every step. Just a wonderful experience." "I especially want to thank you Nicole for all your hard work on my behalf and for putting up with my endless e-mails, phone calls and nagging. Also, thank you to Bill and Hannah for making the delivery swift and complete. Your dealership efforts have not gone unrecognized and just about everybody in my contact list will hear the story." "The staff at Forest City was wonderful. I have never had a dealer treat me as well as the folks at Lichtsinn Motors...I can't imagine buying an RV anywhere again except at Lichtsinn." "Excellent communication! You have distinguished yourself by your attention to detail regarding communication before sale, during sale, after sale and delivery. The quick response to questions by phone, e-mail and your informative website gave us a level of confidence about purchasing our RV from a dealer 1,600 miles from our home. It was amazing actually. You anticipated our needs and met them. As customers, we are delighted!" "You're definitely buying from the right dealer. Ron and the boys, (and girls), will impress you. You can stay right on his lot and/or roam the area for a few days to get the feel of the unit. Make sure you use everything to make sure all is well before heading home. And don't be afraid to ask lots of questions too." "All in all, we appreciate your employee's attitude and cooperation. Thank you also for letting us stay the night so we could get a feel of the newer 'home'." "We have been looking for information on the Reyo/Via and found your excellent video of your stock model on the website. Congratulations for the best structured and informational RV website we have found." "As a business leader, I know you know the acronym ROI stands for Return on Investment. However, sitting on Customer side of the desk, I look for different ROIs: Relationships, Opportunities, and Improvements. In every single case throughout our three day visit to Lichtsinn Motors, Jason, Amanda, Mike, and Brad worked with Jo Anna and me consistently and enthusiastically building ROIs. Personal examples include: Jason's guidance to help get us from four models down to two and then his leadership to understand when our relationship needed time alone inside both the Via and Profile in order to reach a final "family-driven" decision." "I appreciate the service that puts the customers wishes 'first'. We are looking forward to taking our 2009 Tour south for the winter and will see you again sometime in 2010." "We decided to go with a new one [rv part] and the cheapest actually was Lichtsinn Motors in Iowa..I guess they are right next door to the Winnebago factory. They shipped one out yesterday and I should get it tomorrow. I have the unit pulled out so we just have to be without water until tomorrow." "I can recommend your dealership to anyone, and I would buy from you again for sure if I needed a new Winnebago. Two things were important to me: Being as close to the factory as possible and a fair price....The treatment I received at your dealership was outstanding. The whole experience was well worth the 2,500-mile drive. A couple months ago I had a chance to test your parts department when I needed a few parts for some minor modifications. Excellent service again. All genuine Winnebago parts for a reasonable price in a very short time. Thank you." "Vehicle is nicely prepared upon arrival with pre-inspection check already done... Good orientation. Detailed walk-thru and problems were fixed immediately... Fantastic customer service and hassle-free paperwork... The courtesy car was very helpful." "Buying experience was best seen to date in our 43 years of marriage and buying vehicles. Definitely worth the trip to Forest City and being able to put the first miles on the coach! Strong kudos to Ron Lichtsinn and his service and admin staff..."
"We just wanted to tell you that we appreciate the quick, efficient service at Lichtsinn's and that all the items you worked on are doing great! Thanks again -- we will be back next summer." "Coach was well-prepared prior to our arrival -- even air conditioned. Walk thru was excellent including good technical detail -- inside and outside." "Thank you for getting us in right away on Tuesday. Your service is always exceptional. We love the Access. I've had people where my band performs at various venues check out the Access when they tell me how much they like it." "I still stand by my rave: 9.5 hours of free warranty top-to-bottom service when I passed through Iowa earlier this year, just shy of the 15k warranty. Killer service department at Lichtsinn's. And if you can't pronounce it, well...."
"Your concern to details on the coach impressed us. You take immediate action to solve any problems you find...We would definitely recommend Lichtsinn Motors." "Got the cargo door part, just what I needed! Thanks for the great help, service and prompt shipping." "Thank you Reed. Has been a very enjoyable, interesting and satisfying experience. Had a great stay last night...everything in top notch condition. So glad we bought the View here. Unique rv dealer in terms of quality of products and customer care."